Home baked gingerbread. Aromas of spicy ginger, vanilla, nutmeg, butter and sugar all stirred up like grandma use to make. Our signature lotion formula moisturizes skin with organic African Shea butter and other skin nourishing extracts. It's designed to leave a smooth velvety after touch, never a greasy residue. It can be applied head to toe, and the warm natural fragrance will linger on skin for hours. 8 fl. oz. My daughter is addicted to this company's lotions. 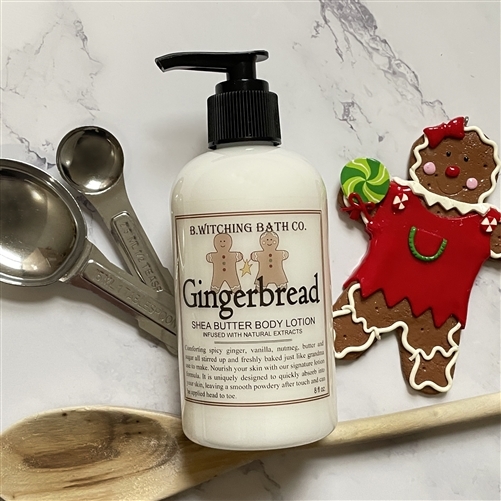 She askes for the Gingerbread Lotion all the time. We just recd a new order - perfect yummy gingerbread fragrance. FYI - wish you had this one all year long.